The Run for Office tool allows users to nominate anyone–be it a friend, spouse or co-worker–to run for any public office in the United States. 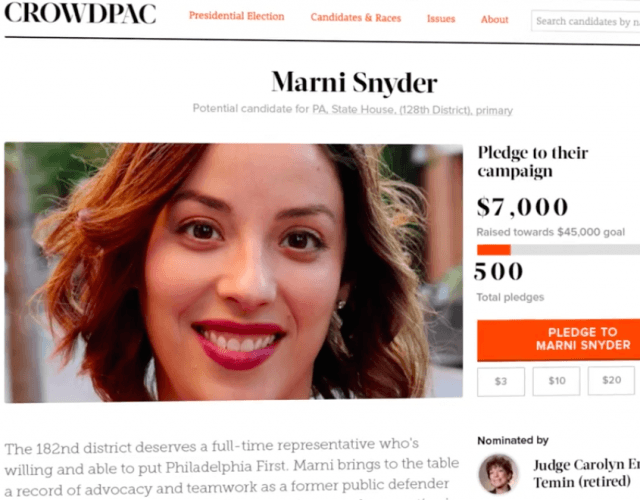 Once nominated, “candidates” can collect financial pledges and endorsements; if they choose to organize a legal campaign committee, any funds collected are turned into direct campaign contributions. The tool allows non-professional politicians to test out support before jumping into a race, says Crowdpac spokesman Mason Harrison. “Our goal is to take some of the friction out of engaging in democracy by applying the principles of crowdfunding to political campaigns,” Harrison told Breitbart News. “There are too many barriers to running for office today,” Crowdpac co-founder and CEO Steve Hilton said in a statement. “The whole system is designed to make it easier for the insiders–the party machines, the big money donors, and the special interests–to decide who runs. Crowdpac uses campaign contributions and other data to provide the most accurate representation of political candidates’ ideologies and issue positions. Some of the site’s recent studies include examinations of the progressive takeover of American universities and the political leanings of the country’s top coffee distributors. This article has been corrected to reflect that Crowdpac is a for-profit company, not a non-profit.